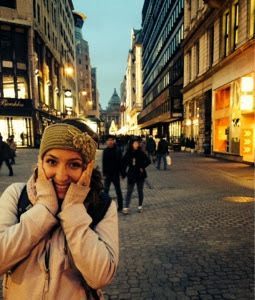 Marshalls Travel Europe: A quick update- Hungary! Since I last posted we have been to nine cities in Italy, two cities in Greece, Bulgaria, Serbia, and now we are in Budapest Hungary. Getting to Hungary was quite the ordeal. Between late trains and bad directions, our 30 hour journey to Budapest turned into a 48 hour journey; that included two nights of "sleeping" on trains. Not the brightest two days of our trip. Frustration ran high at some points, and exhaustion began to set in but as only God can do, our extended trip was redeemed by some pretty cool things. One of which was meeting a guy named Thor, who was bunking with us on our sleeper train. Thor is on his trip of hitting every country in the world (201 countries)! His rules are: he must spend at least 24 hours in every country, he can't go home before he finishes, and he cannot fly at any point. He estimates the trip will take around 4 years. Thor is so smart he got his trip sponsored. As you can imagine Thor was a pretty interesting guy, we really enjoyed our time talking to him. If your interested in reading more about his adventure you can find information at http://www.onceuponasaga.dk. 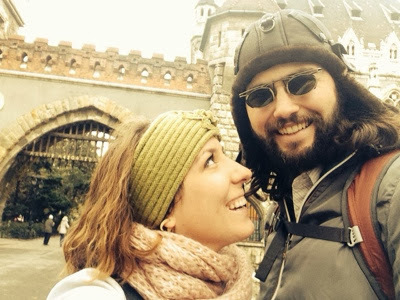 We've spent a couple days in Budapest (heading out tomorrow). It's a really cool city. Food and lodging are cheap so we are enjoying our first, and probably only, four star hotel, as well as a lot of eating out! We visited a bath house which is apparently a very Hungarian thing to do. 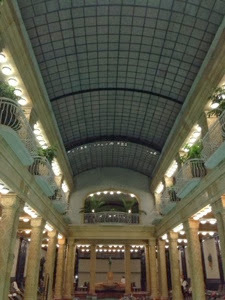 The one we went to was from the 1920s with Art Deco deccore- totally our style! Many thermal baths and steam rooms. It was quite the luxurious experience. 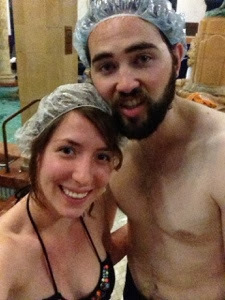 Shower caps were a must in the pools. We found a Christmas tree tonight!Can you tell I'm excited? We head out to Austria tomorrow to see our friend, Juliana for a couple days! I'll try to post Italy and Greece pictures soon. Follow our Europe blog by Email!